The whole of European basketball is in financial crisis, even the richest clubs are reducing their budgets for the coming seasons. 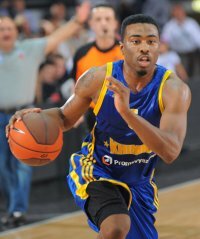 But the Russians of Khimky are definitely going against the current trend as it has just extended, for no less than four years, the contract of Keith Langford (born in Fort Worth, 1983, 1.93cm, represented by Greek agent Nick Lotsos) for an average of around 2.300.000 $ guaranteed until 2015. The US guard began his career in North Crowley High School. In 2002, he signed up for Kansas University, which he helped reach the NCAA Final Four twice, in 2002 and 2003. His pro debut were in the D-League with Fort Worth Flyers. Then, after having taken part in the pre-season camp with the Houston Rockets, he signed for Vanoli Soresina (in Italy’s second division). After a brief spell at San Antonio Spurs, he was back in the D-League with Austin Toros in 2007-08. He finished that season in Italy with Biella (Lega A). He took part in the NBA Summer League 2008 in Las Vegas with the Denver Nuggets in summer 2008 before flying back to Italy where he played for Virtus Bologna in 2008-09 (still in Lega A). Two years in Khimky and this crazy four-year contract extension followed.